Color: Black. 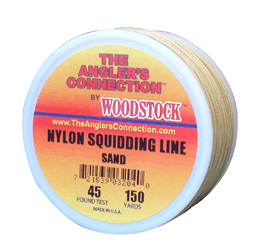 This round, hard braided line assures long, accurate casting and smoother retrieval; and is heat set. Color: Sand, Green. 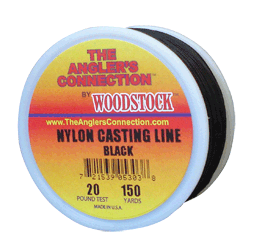 A softer braid, heat set and water-proofed for longer life and durability. This line has been the standard as a super catfish line. Braided Mill ends are over-runs of various lb. tests and colors of braided Dacron and Nylon lines. Packaged in a 12 pack base-deck display, Mill ends make the ideal impulse purchase. 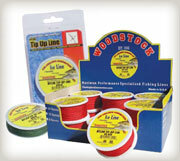 They can be used for everything from reel backing to jug fishing or even for tying up tomato plants. Color: Dark Green, Black, Tan, or New Red. Fluorescent Colors: Red and Pink, Orange, Blue, Lime, and Yellow. Heat set and water-proofed to reduce stretch and freezing. This line offers exceptional toughness. Available in Fluorescent Colors for an Extra 10%. Please specify if you want Regular wax or Heavy wax.